After the start of the year I started in an on line poetry class. It has been a challenge for me to stretch beyond what I normally write and to find the Divine in each subject. The class is titled: The Study of Myth. This poem is from one of the earlier classes that included the story of Adam and Eve. So this is my version of Adam and Eve. Succulent fruit hanging on the vine. living a life of grace and easy. A garden of love for animals, insects, plants and trees. God gave them the ability to co-create. protected by a serpent of truth. the souls were hiding inside. 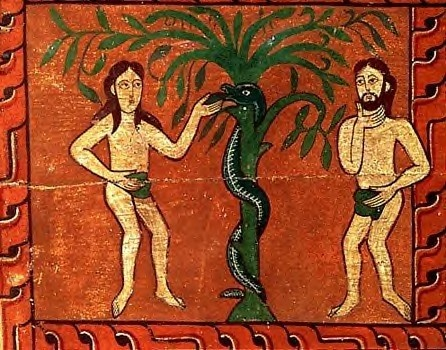 is what this serpent said to them. Asked the snake then hissed and moved slow. from the Divine that created all of this. Yes, it is your choice to taste the fruit. or creates a world of fears and hate. to reveal the lush fruit. Who has given you this freedom to choose. Receiving you back regardless of what you think and do. as they bite the fruit from the forbidden tree. into a world of illusions and fright. floating in a perfect array. with specs of green among the grey. of the creativeness of God above. I sit in knowing the Lord is there. with their stems reaching high for the Lord to see. I know this gift is the Lord’s calling card. that I have chosen to live within Thee. And that perfection is me! I release myself from my human sight. What is here in front of me. You lead me on my way. I started saying this prayer/poem over a year ago in some form or another. Once again today it helped me find what I miss placed. I also use it when I feel a block from my human life filter. Sometimes we need help to know the truth in experiences/situations. So please feel free to use this to help you see what the divine puts in front of you. I love to hear if it helps you find what is miss placed or your vision/thoughts of an experience change. I am proud to say today is my 1 year anniversary with this blog. Thank you everyone who reads my words and who has encouraged me in my spiritual journey. The words you share on your blogs have been inspiring and have helped me grow spiritually and emotionally. I am most grateful for our friendship. I live in unity with THE ALL, in harmony with Universal Law, in peace with all God’s creations and in love of self and others. As a divine creation of God I am good…I am worthy…and filled with the spiritual energy that flows through me and in me as I am the manifestation of God’s divine plan. I am a demonstration of Gods goodness and my opportunities are unlimited. I chose to live in the present with God’s love and energy indwelling and expressing. I open my mind to universal knowledge and the divine truth as expressed through God. I see with my eyes the beauty around me…the simplicity of divinity and the magnificence of Spirit. I speak with my voice the words that Spirit crafts and with these words I share love and joy with others. My heart is open for the Energy of God to express through love given and received. It is God’s divine intent that I am deserving of love and loving and I allow my heart to release and receive. In an open embrace I accept the joys this day brings and I know it is God’s will that I receive all goodness and grace of life. I allow my feet to travel where the Lord leads me. I trust in the Spirits manifestation through me as a divine expression of thoughts and joy. So today I chose to walk within the limitless consciousness of God. I stand in the light of Knowing that God’s thoughts demonstrate truth….joy…love…and abundance. I am that Truth…as God is me…and God’s thoughts are my thoughts. I am the very essence of the divine Universal Energy. God creates with purpose…with perfection so there can only be perfection in my life with God today. I am eternally grateful for my unity with God… for the divine experience of thought and the physical reflection this Universal Spirit produces. My gratitude over flows as I live in the abundance of this creative process…The God Process…The universal law…and the truth of this law. I release this prayer knowing the reflection of these thoughts and words will be done…and so it is. Over these past 10 months I have been learning about a new way of praying called, Affirmative Prayer. I would like to share a prayer I wrote to bring in the Abundance of Joy into my life. The past three years of my life have been marked by great change, much I controlled and some I did not. What my spiritual teachers have been teaching me is I can choose to bring joy into my life. So this pray is about experiencing God’s joy, seeing the beauty of God’s creativity and allowing myself to be led. For several weeks after I wrote this I said it every morning and many evenings. It is my belief that this pray with other prayers I wrote have been answered by the words in poetry that I have been posting. God has so graciously blessed me as his words flow through my fingers to the computer screen. If this prayer speaks to you please feel free to use it. Across the grass and flower heads. The rabbit nibbles in the herb bed. Water flows into the pond below. My mind wandering is a restful thing. For the blessings God reveals to me. Creating stories for the beauty I see. Is all I need to live so free. Life exists in a lucid paradise. A place without time or space. A place within my mind’s grace. A lucid mind creates thoughts with reality. A lucid mind I don’t fear to see. So clearly defines my verity. I now understand how my thoughts give. For the truth of God has clarified me. What prism do I see my life? Or the veil of pain? On what path did I chose to travel? Locked in my human brain. Who am I to possess the Eternal Flame? To the beauty that is there? Divinity created by the Lord. Of all that exist on this earth. I am one with God.